Sometimes you need to have a little area where you can escape from the disaster that can be the household. However, you don’t always have to travel far to obtain that feeling. You can create a little nirvana for yourself in your own backyard. There have been many creative people that have transformed one of our storage buildings, gazebos or screen rooms into a meditation room, workout room, or an area where they could relax and have a moment to themselves. I personally would choose to have a portable storage building to create the ultimate “man cave” with huge leather chairs, a projector screen that would come down from the ceiling and a collection of my favorite movies to watch without interruption. Some of you might be wondering, “How would a portable building make a good man cave?” Well, these portable storage buildings are extremely well built and can survive hurricane force winds up to 160mph. Also, they’re super easy to maintain, it takes no more than a hose to wash out debris that gathers around the outside of the building for most cases. It would start out with a simple gazebo in the backyard with calming and warm flowers around the exterior. I’d have a yoga mat in the middle with the windows of the gazebo fully open and shining in light. It’s very simple and perfect to help clear the mind of all stress you have. I feel anything else would be a distraction and start cluttering up your meditation space. If your dream getaway is when you’re psyching yourself out for a great workout, then creating the ultimate gym in your backyard will be the ideal retreat for you. This can be as simple or complex as you want it to be, however for an ideal workspace, you’ll need to have at least a 10’ x 10’ area, which is a perfect size for one of our portable screen rooms. You’ll want to work out in a space that’s protected from the outside elements, but has some natural lighting and screen windows for fresh air. As long as your workout space has room for a weight machine for all your different lifts and some cardio equipment, then you should be set up for a perfect getaway for you. These are a few ideas for our portable buildings. How would you use one of our buildings to create a backyard getaway? Considering purchasing a portable building but worried that the upkeep might be more than you can manage? If you purchase a portable building from Buildings and More, you can rest assured that your building will not only be durable for years to come, but that it will require minimal upkeep. The first concern many homeowners in Florida might have is how these portable buildings will hold up during hurricane season, which lasts from June 1 to November 30. Florida already was doused by Tropical Storm Andrea very early this season, and the National Hurricane Center estimates a very active hurricane season this year. All of our portable buildings have a wind load up to 160 mph, which would register as a Category 5 hurricane, the most destructive classification of storms there is. In addition to the wind load all the portable buildings have, the buildings are anchored to the ground using mobile home anchors. If the building has a concrete foundation as some larger portable buildings and carports might, they are anchored to the ground using concrete anchors. 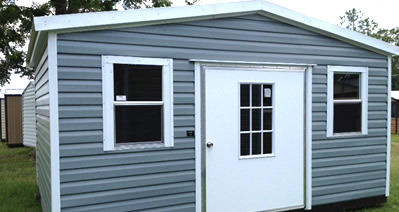 Aside from knowing your portable building can withstand storm-force winds, our portable buildings require little to no upkeep to keep the exterior looking new. You don’t have to worry about paint or ongoing pest control services, and if you need to clean the exterior, a simple solution of bleach and water is all you need for a slight scrub down. 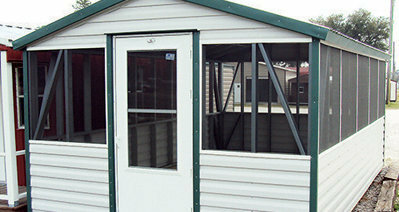 However, the cleanliness of the interior of your portable building is up to you. A broom should be all you need to keep the interior of your portable building clean, depending on how frequently you use your building and how you use your portable building. Let’s face it: We tend to hold onto a lot of “stuff.” And when our homes are overrun with our stuff, we look for other storage options. Approximately 10.8 million households, or 1 in 10, currently rent a self-storage unit, which is 65 percent more people than just 15 years ago. The total amount of rentable storage space in the U.S. is now 2.3 billion square feet, which is about 78 square miles, or an area that is three times larger than Manhattan. Even with the average home size increasing, the need for storage continues to grow. The average lease for residential self-storage is 11 to 12.5 months, and commercial storage needs are even greater. The average commercial self-storage lease ranges 23 to 24 months, giving storage companies ample opportunity to reap financial benefit from your crowded space. While rental prices for storage units range depending on location and facility, spending a year or two paying storage fees isn’t the best option financially when you can rent to own your own space, or purchase a custom storage unit outright. In addition to the fees you pay to rent your storage unit, you’ll need to factor in time and money spent driving to and from the storage facility when you need to get your items out. 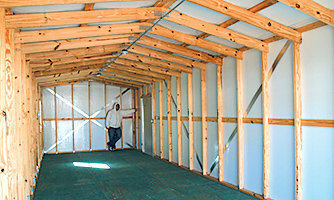 Instead, consider purchasing a portable storage building or renting to own. Not only is this a better deal financially, but you will also always have immediate access to whatever items you keep in storage. Plus, even if you move homes, you can easily take the storage building with you so you have it available on your new property. We offer several financing options, with rent to own programs that feature low down payments and affordable payment options that fit your budgets. 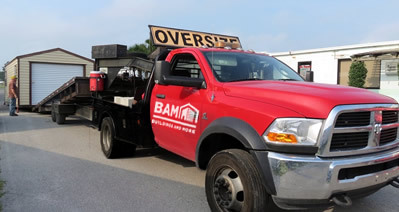 Our storage buildings can also be built with your custom needs in mind, so you never have to settle with what the storage company has to offer. And because it’s your building, you don’t have to worry about shoddy storage unit upkeep. The days are getting longer, the temperatures are heating up, and the backyard is calling your name. With Memorial Day and the official start of summer creeping around the corner, now is the time to make those last-minute preparations to get your yard ready for its favorite months of the year. Looking for some ideas for how to turn your backyard into a summer oasis? Here are some ways to take your yard from mediocre to magnificent. Looking for a shady place to relax in your yard this summer? Gazebos have a timeless look and feel about them, and they are the perfect place to hold a special event this summer. In addition to their looks, they provide much needed protection from the harsh summer sun. 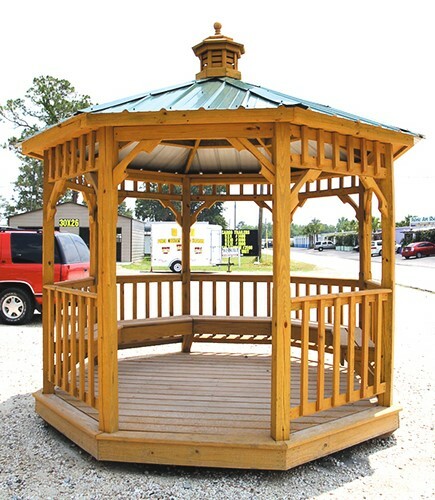 Our custom portable gazebos can be built with a variety of stain or paint colors to match the look and feel of your home, and the gazebos can feature benches, tables, or swings based on your needs. For anyone looking for a summer shelter that offers a bit more protection from the elements, a custom screen room might be a better fit than a gazebo. Most gazebos aren’t screened in, which could be problematic if your area is prone to pests in the warm summer months. Our portable screen rooms feature treated pine decking, steel walls, and roof framing, offering you and your family maximum comfort and protection from the elements. Our screen rooms can even feature electricity and an enclosed storage area, depending on your needs. No matter how hard you try, do your plants still only make it to seedlings before they shrivel up? If you plan on spending a lot of time in the yard this year and don’t want to stare at only hardy grass, consider hiring a professional to landscape your yard. Landscapers will be able to design a yard that features plants that will thrive in your environment and can keep unruly bushes and hedges in check. Some landscaping companies can even offer water features for your yard if you’re interested in a fountain or fish pond. Just be mindful that if you have little ones, this is something you’ll need to keep an eye on while they’re playing outside. It’s probably been a while since you’ve used your grill last, and there will be a few things you’ll need to do to prep for its first use of the season. First, remove the grill cover and check for any pests that might have taken up residence in the cover or the grill itself over the last few months. Next, if you have a gas grill, check the gas lines and tank to make sure that the lines are in working order and the tank is full. To clean the grill, most people will fire it up and let the built up residue burn itself away. After you’ve let it heat up and sit, let the grill cool and scrub it down with a grill brush to remove any remaining residue. The grill will be significantly easier to clean after you’ve heated it up. If you choose, you can rub it down with oil using your grill brush. When it comes time to make an addition to your home or to transform a patio into a screen room, most people initially think of hiring a contractor or carpenter to begin the lengthy process of building that addition. Though you obviously want any addition to your home crafted with the same care as the initial construction, there is an option that is growing in popularity among homeowners: steel buildings. Steel structure and modular buildings have become the norm for new buildings in the industrial and agricultural fields, and the same attributes that make them work for large companies will make them excellent additions to a new home. If you’re looking to add to your home or need some extra storage on your property, here are a few reasons you should consider a metal building. 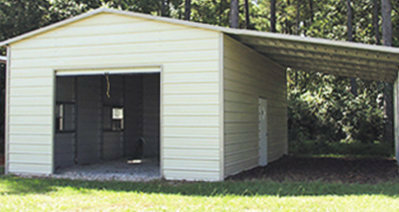 Many people might assume that a portable building would not offer the customization of a contractor-planned building, but Buildings And More offers a range of structures to meet any need and taste, from metal carports to storage buildings. Depending on the size and purpose of your steel building, you may not need a permit – a time-consuming process for any traditional construction. Steel is one of the strongest building materials available, and every steel structure we offer is made of 100% U.S. steel and manufactured to rigid standards for durability and safety. Steel structures are also impermeable to termites, insects and other pests, which makes them ideal for outlying structures or additions that are usually susceptible to pests. Additionally, since steel is much lighter than wood, concrete and other traditional components, a metal building can be built taller and larger than a traditional structure, with decreased stress on the foundation of your home. Choosing a steel building reduces many of the design and site hurdles that conventional construction would face. With no need for design or architectural drawings, and with almost no wasted materials, a portable building can be placed days or weeks after your purchase, rather than months. Once you’ve purchased your new metal building, there are almost no additional costs. Steel buildings are incredibly resistant to unpredictable weather, and any maintenance costs will be minimal over the life of your building. 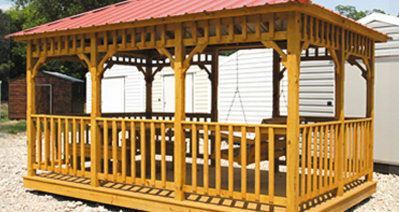 Even wooden structures like gazebos or screen rooms are made with pressure-treated pine designed to stand the test of time. 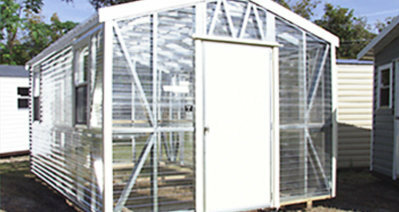 In addition to the reduced cost of labor and materials for the new addition to your home, Buildings And More offers flexible financing and rent-to-own options for most of our inventory of steel buildings. You can always purchase your new structure outright if you choose, but we offer the flexibility to receive the same great service with friendly financing terms. 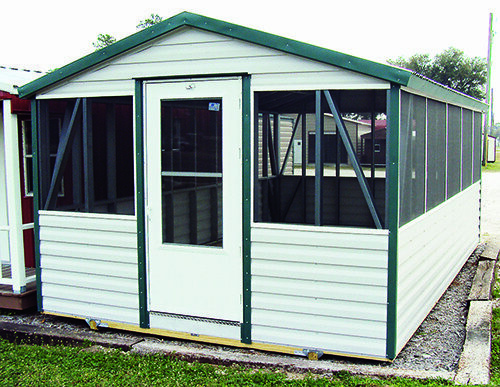 Unlike a permanent construction, you can take a portable building with you if you move to a new home down the road. A new screen room will often become a favorite place in your home, but choosing a portable screen room means that a moving company will easily be able to transport your favorite outdoor spot to your new home.